If you like eggs, you’ll love fetal duck eggs (hột vịt lộn) because they are, quite simply, ‘eggier’ than regular chicken eggs. 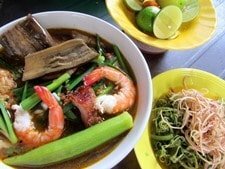 Don’t be put off by the name or what they look like: this is a great, tasty, nutritious and cheap road-side snack that can be found anywhere in Vietnam. Just as soft-boiled chicken eggs are a favourite of children in many western countries, so too fetal duck eggs are popular with kids in Vietnam. They’re warming, comforting, fortifying, and fun to eat. Sold by street vendors nationwide, fetal duck eggs are served with several essential condiments and they’re beautifully presented. There’s something simple, rustic and exciting about this snack: so get over it, and start eating it! A fetal duck egg is a fertilized egg that has been kept warm for around two weeks until the fetus is partially developed, then it’s boiled and eaten in the same way you would a ‘normal’ chicken egg. No doubt this sounds repulsive to most readers, but it really is just a matter of getting used to it. Ultimately, the taste – not the idea – of a food should be what counts. The first time I tried fetal duck egg I wasn’t aware of what I was eating. When I reached the fetus of course I was horrified, and of course I didn’t finish it. Later, a Filipino friend of mine told me how popular the eggs are in the Philippines and how much he loved them. Then I observed how children in the Vietnamese countryside gather around vendors outside their school gates in the afternoons to eat the eggs, and how Vietnamese men tuck into the eggs while out drinking beer. 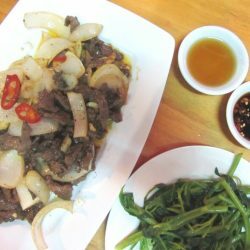 After living in Vietnam for a while, I learned to trust the Vietnamese palate, especially when it came to more ‘unusual’ foods. I made an effort to try the fetal duck egg again and it wasn’t long before I was hooked. Fetal duck eggs are sold in many restaurants, especially shellfish eateries, but they are best enjoyed as street food from one of the vendors on the sidewalk. They’re easy to spot because you’ll see rows of large, porcelain-white duck eggs either stacked in a pyramid or displayed in large egg cartons. 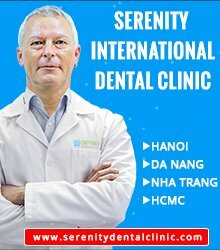 Look for signs saying ‘hột vịt lộn’ or ‘trứng vịt lộn’. A friend of mine pointed out that it’s very easy – at least for non-Vietnamese – to mispronounce the word for fetal duck egg as something quite rude, so perhaps it’s best to just point at the eggs, unless your Vietnamese is tone-perfect. 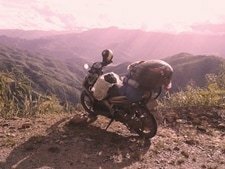 In my experience, the eggs are better in the countryside than the cities: some of the softest, juiciest, tastiest eggs I’ve ever had have been during motorbike rides in the middle of nowhere. 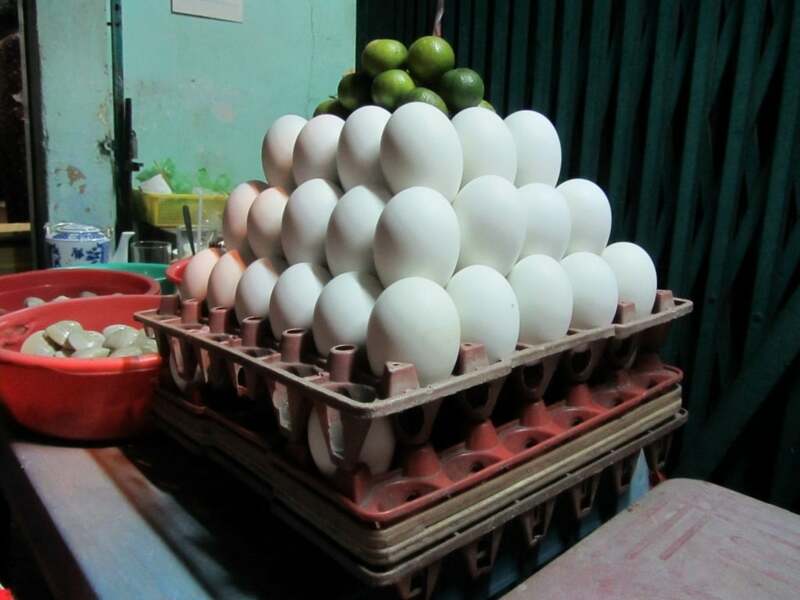 Each egg costs between 5-10,000VNĐ (less than $0.50). 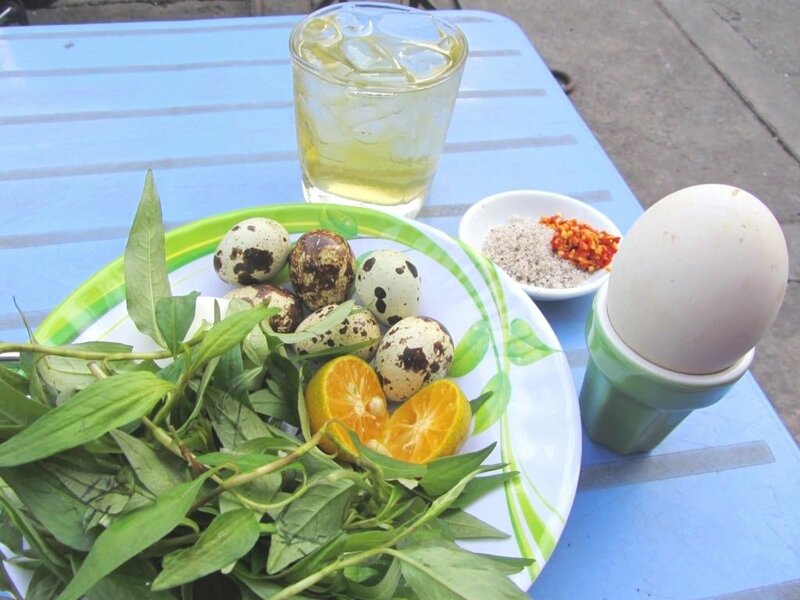 For this you get an egg in a pretty egg-cup on a bed of rau răm (a peppery leaf known as Vietnamese coriander), and a small saucer of muối tiêu chanh (salt, pepper and lime or sometimes calamansi). 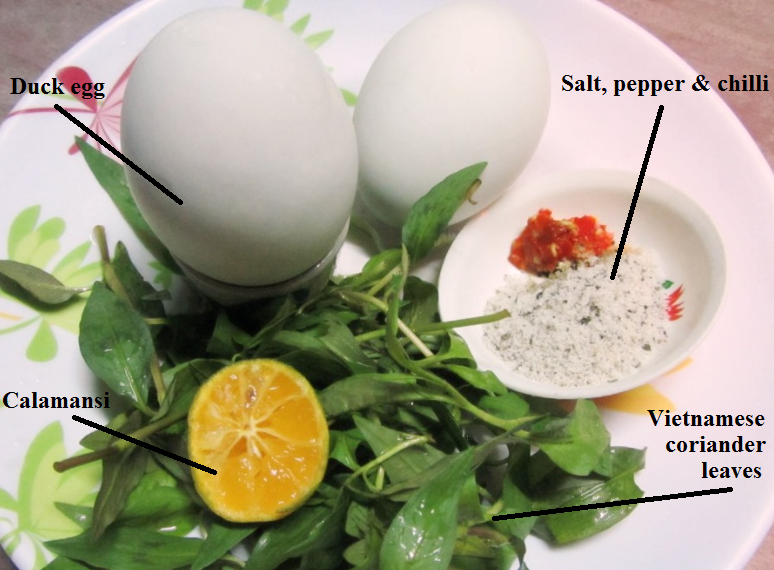 These three elements look great together, and their flavours complement each other perfectly: the richness of the egg is tempered by the salty-sour of the muối tiêu chanh, and the Vietnamese coriander leaves are eaten after to cleanse the palate – a bit like the mints you receive at the end of a meal in some restaurants. Fetal duck egg is served in other delicious ways in different regions of Vietnam, including pan-fried in tamarind sauce with peanuts, and steamed with fresh ginger – both fantastic combinations. 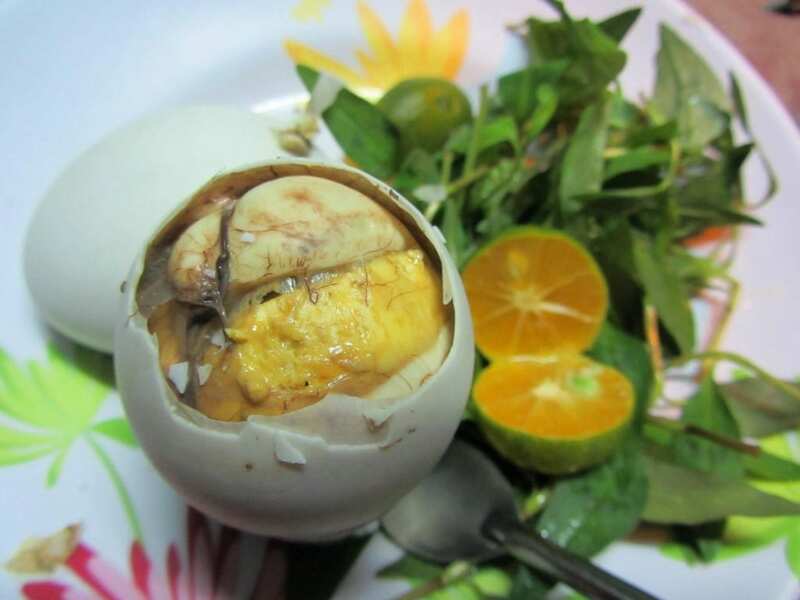 Although Vietnamese eat fetal duck egg in many different ways, the one I described above is the most common in southern Vietnam. Tap the top of the egg and make a small hole in the shell from which to drink the juice – sounds horrible, but it’s not. The hot, wholesome juice is warming and invigorating in the same way that a sip of whiskey on a cold evening is. Mix the salt, pepper and lime together in the small saucer, adding a bit of red chilli if needs be. Lop off the top of the egg, drizzle some of the mixture into the shell, and eat it with a spoon as you would a soft-boiled chicken egg. It tastes like, well, egg, but a deeper, richer, ‘eggier’ taste than you’ll ever get from a chicken egg. 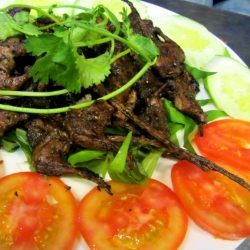 The partially formed fetus adds a gamey, meaty flavour, and the salt, pepper and lime-juice mixture gives it an essential twist that brings everything together – in the same way that a pinch of salt transforms a plain fried egg. It’s just the right balance of colour, flavour and texture. If you’re an egg-lover the only obstacle you have to overcome is the idea of the fetus. 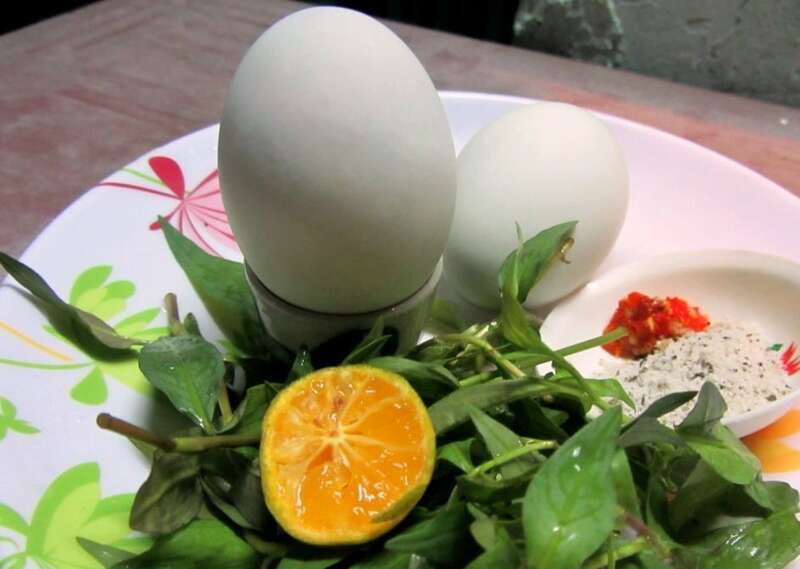 If you can do that you’ll understand why millions of Vietnamese, Filipinos and Chinese eat fetal duck eggs each day…..and then you can try the equally delicious fetal quail egg. 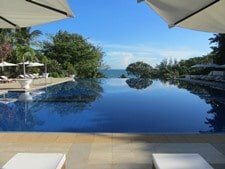 This entry was posted in ALL, FOOD & DRINK, Street Food, Weird Food and tagged balut, blog, duck, egg, fetal, fetus, food, guide, Vietnam, weird. Bookmark the permalink. 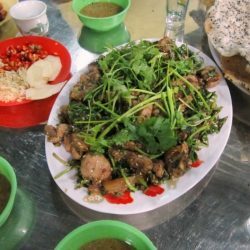 You should try it on 104 Xuân Thủy, District 2. My friend just introduces this address for me, so tonight i will go there to get it. 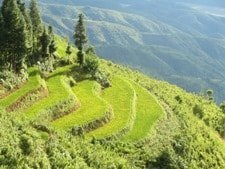 About the word: you’ll have to ask your Vietnamese friends about that 🙂 But it’s all about the tone you use to say the word. too much political corectness Tom :). I had to dig a little deeper into internet to find out what damage can be done if I mispronounce. 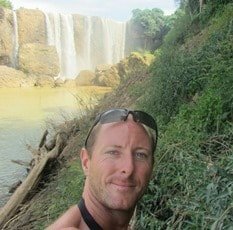 I need to know it because I am coming back to Vietnam in march and I don’t want to offend anyone. If you haven’t had the opportunity to try it I have a friend who has a restaurant in Vung Tau where he batters then fries hột vịt lộn. It’s not on the menu and a little decadent but a nice treat once in awhile.